The business media phone for H.323 and SIP environments combining one-touch video calling, integrated business applications, and advanced IP telephony in a flexible, future-proof Unified Communications (UC) solution. The Polycom® VVX® 1500 D dual stack business media phone unifies video, voice and applications capabilities in a simple-to-use personal communication solution. With its unique touch screen interface, the VVX 1500 D makes video calls as simple as using a desktop phone. Its large display and ease of use make the VVX 1500 D an ideal productivity tool for today’s busy executives and professionals, whether they are in office, retail, professional services, or healthcare environments. The Polycom VVX 1500 D includes an integrated camera and delivers easy and instant business-grade video calling with a simple touch of the screen. With native H.323 support, it connects easily with all standards-based H.323 video conferencing and telepresence systems, such as the Polycom HDX® series, and real-time media conference platforms, such as the Polycom RMX series, enabling mass adoption of business-grade video in the enterprise. The VVX 1500 D has multiple adjustable elements including camera tilt, base height and screen angle to suit the environment and a user’s preferences. The Polycom VVX 1500 D business media phone features an open API and WebKit-based full browser that enable third-party developers to create applications that integrate the VVX 1500 D with business systems such as UC, customer relationship management (CRM), and other vertical business applications. The VVX 1500 D comes with a Web service called Polycom My Info Portal, through which customers can select to receive personalized Web content, such as stock prices, weather, and news. The Polycom VVX 1500 D is equipped with all of the capabilities of a full featured SIP IP phone including: six lines, Polycom HD Voice technology, a Gigabit Ethernet switch that supports PoE, and a host of voice telephony functions. These features can be accessed via the buttons on the front of the phone or by simply touching the large color display. Use of the voice telephony functionality requires integration with a Polycom certified SIP call control platform. With H.323 and SIP dual stack support, the VVX 1500 D business media phone delivers a future-proof UC endpoint that integrates voice, video and applications into an overall UC solution. Enterprises can implement the VVX 1500 D with existing and new H.323-based video networks today with the flexibility to integrate it with a SIP IP telephony call control platform in the future. * The activation of voice telephony functionality requires a Polycom certified SIP-based call control platform. 2. Requires Polycom SIP software version 3.2 or higher. 3. Voice telephony functionality requires integration with a Polycom certified SIP-based call control platform. 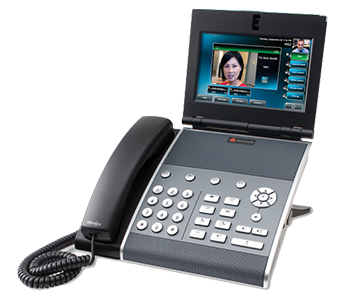 Download the YipTel Polycom VVX 1500 Datasheet (PDF).